sweater and bag c/o Choies, skirt is thrifted, socks are thrifted, necklace is thrifted and shoes are from Asos. Well, I can't say much more about this outfit other than I'm wearing a heck load of pineapples. I also want to point out that this is one of my last posts with sponsored clothes from the companies that I am discontinuing sponsorship with, and now I am endeavoring to make many more of my own clothes (see below)! Hand-drawing all those watermelons took a while but it was totally worth it! I can't wait to share the tutorial with you all really soon! 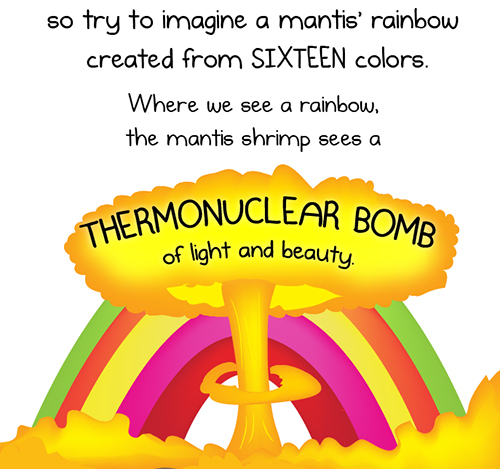 So this comic from the Oatmeal about why the Mantis Shrimp is the coolest animal in the world is both sciencey and hilarious - and you should have a read of it! Not only do mantis shrimp have 16 colour receptors (as opposed to our measly three which alone allow us to see some pretty amazing sunsets), but they're also insanely strong. I won't give away much more - you can have a read here. The Mantis Shrimp will either become your favourite animal or the animal of your nightmares. Your watermelon print looks awesome! I'm basically doing that (but a lot of it) for my senior thesis project this year! That watermelon print has got to be the cutest, most fantastic thing I have seen in at least a week. You never fail to amaze me Annika! Your pineapple theme is darling. Makes me want to go to Hawaii. Can't wait to see the clothing you create! I was able to access the "reader" option in this post so I was able to read all of your text. Yay! 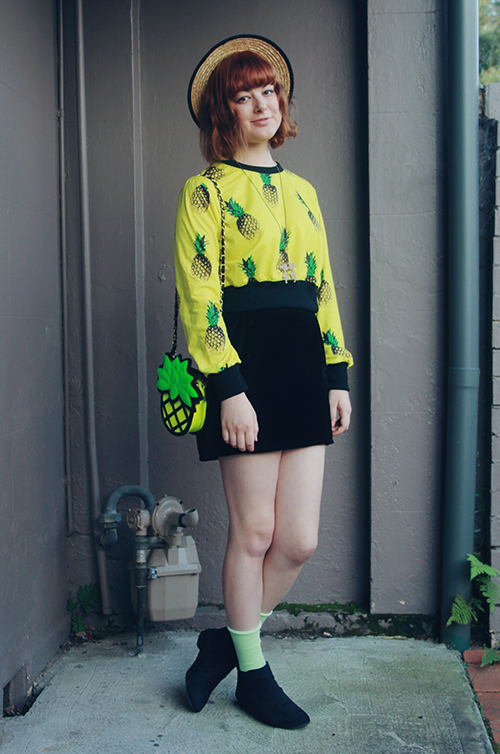 This pineapple sweater! What a fun print. I can't wait to see your watermelon shirt too! I read the comic and it's amazing, haha! I also love your look, especially the skirt! Oh my goodness, this is perfect! This is one fruity delight of an outfit :D So excited to see more of your watermelon top too! You are such a cutie! I love the pineapples! Love the hand printed watermelons, definitely not something I have the patience for so bravo! Ahh this outfit is so cute! I'm obsessed with any fruit print, honestly! 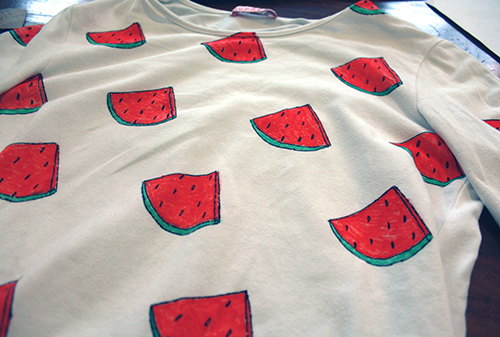 The watermelon tee you're working on looks adorable! loooooove your socks!!! LOVE YOU!!!! I love the fact that fruits are a part of fashion because they give so much flavor to the outfit *. * Also, that bag is incredible! I love small bags especially with a cute design. You are like a Hawaiian dream in all those pineapples. ;) Following you on Instagram now, just to see what you do with that watermelon print! As much as I love fruit, I don't know how I'd feel about wearing them. I would be worried that people would try to take a bite! Question: What came first, the bag or the blouse? oh how absolutely sweet is that pineapple shirt and the bag! you are such a sweetheart! I love your pineapple themed ensemble!